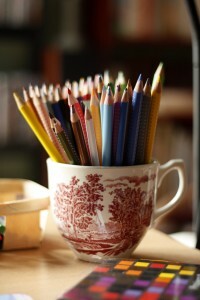 The pleasures of a home office | A creative life tangled up in lovely yarn! These days I am working from home and have taken over the library as my office. There are a few perks here I would say; I have a corner office with a stereo. The view is nice and I have a full kitchen available for making lunch! The best of all is not to have to hurry out the door in the morning. There are a few down sides too. I have no colleagues to chat with during breaks or to bounce ideas with. Internet is a good way to stay in touch with likeminded people, but it isn’t the same. A Skyp meeting comes close to a real meeting, but the way I deal with the lack of colleagues is to invite friends and people I know out for lunch or a coffee. With my work now being a mixture of creative and production, it is so nice to get out and listen to other people and what they are doing. It gives me a good break and I can go back to my work with a fresh approach. An a new approach is what I need now that I have started working on my second book proposal!